It’s that time of year again, and Griffin Bay Bookstore will hold its annual Open House and Sale on Saturday, November 10, 10:00 am—6:00 pm to celebrate 39 years of bookselling. 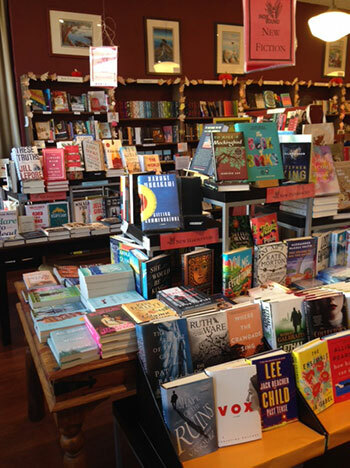 You’ll find the bookstore brimful of the latest in fiction and nonfiction, with 20% off on all books on the shelves. The annual Open House and Sale is Laura Norris’ way of thanking our island community for loyal support and ongoing patronage. Be sure to stop in for cookies and coffee or apple cider, and shop to your heart’s content. If you want to start on holiday shopping and take advantage of the sale, look for what’s new for bird lovers such as Adam Nicholson’s The Seabird’s Cry; for book lovers, The Library Book; and a must-have for American history buffs is Jill Lepore’s These Truths, Fans of Michael Lewis will want his latest, The Fifth Risk. And if you’re looking for novels that shed light on the times we live in, try Pat Barker’s The Silence of the Girls, Unsheltered by Barbara Kingsolver and Lake Success by Gary Shteyngart. For the children in your life, Zola’s Elephant is gorgeous. And for a great true story, The Hen Who Sailed Around the World; for Middle Readers, Louisiana’s Way Home, LU, and City of Ghosts. Young Adult readers will surely be drawn to: Bridge of Clay by Marcus Zuzak and Dry Neal Shusterman and Jarrod Shusterman. As usual you’ll find the bookstore stocked with wide range of gift items. There’s an ample supply of Advent calendars, stationery, boxed cards, holiday cards, thank you notes, and colorful journals. There are plenty of 2019 day planners and calendars to get you off on the right foot in January. And jigsaw puzzles and games galore for both children and adults. For long wintry nights, Griffin Bay Bookstore can help you keep a steady supply of good music and DVDs—a great, handpicked selection of movies and boxed sets of BBC productions. Griffin Bay Bookstore is part of IndieBound, an off shoot of the American Bookseller’s Association, developed to promote the benefits of independent bookstores across America as well as the benefits of shopping or buying locally. When you shop locally and support your independent bookstore you discover what’s new, what’s great to read. And you nurture your own community and its well being, just one more reason to attend Griffin Bay Bookstore’s Open House and Anniversary Sale on Saturday, November 10 10:00—6:00 p.m.! It’s a community tradition.